The Modern Equivalent of Smashing Your Television? What’s the message here? 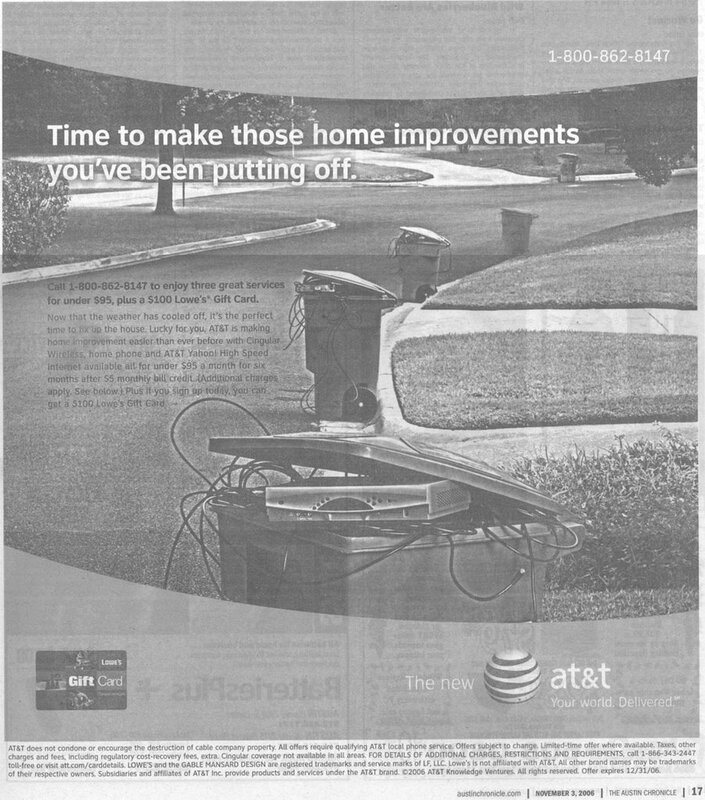 “We don’t offer a directly competing service; we just hate cable TV?” I understand they’re going after Time Warner’s All-in-One offering–a combo “deal” of cable TV, broadband Internet and IP telephony services–but by highlighting the one service (cable TV) to which AT&T doesn’t offer an alternative? What sense does that make? From a props department perspective they’re spot-on for Austin–that’s exactly my DVR and trash cart. Aesthetically, I also like the juxtaposition of the imagery with the slogan, “Your world. Delivered.” If they were attempting to artistically portray the inherent bleakness of suburban living, there’s nothing like cable equipment and trash day, the jumble of wires counterposed with sleek, hard, silvery technology, the manicured and chemically-enhanced yet sun-blasted lawns, the regimented march of the carts brimming with pointless waste, the empty streets and driveways utterly devoid of humanity or purpose. And even though the medium we’re looking at is the Austin Chronicle–with a readership more likely to interpret it this way–I’m pretty sure that’s not where AT&T wanted to go. 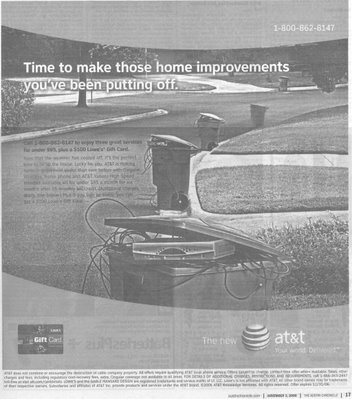 This whole debacle had its genesis in the forced metaphor of “home improvement” (itself a promotional neologism coined to obfuscate the pain of doing it oneself), the shotgun marketing synergy of AT&T and Lowe’s. I bet everyone involved with the project now wishes they had just called in sick that week.